Waco "Documentary" Is A Hoax! 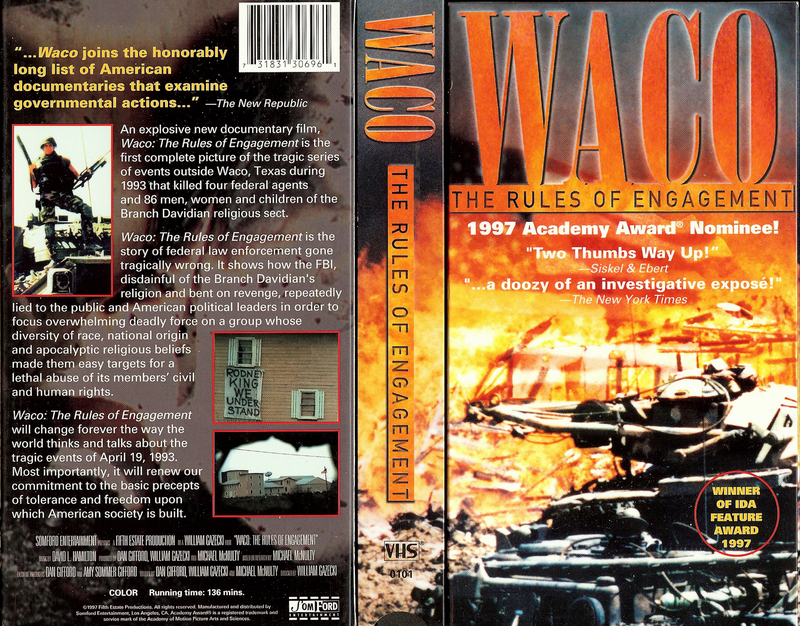 The complete VHS cover for the retail video of Waco: The Rules of Engagement. Published by Public Action, Inc.
OK. I've sat through two showings and studied the script. I've looked at the web page and read the reviews. Waco: The Rules of Engagement, the much ballyhooed "documentary" on the Waco holocaust, is a hoax. It is an effort to misdirect and muffle protest over Waco under pretense of protest and opposition. It hides the most damaging truths, misdirects attention to false issues. Thus it neutralizes outrage that would be felt if the true facts were known. It forwards murder charges based on weak evidence; once the charges are discredited, the public will be inoculated against considering real evidence that the Davidians were murdered. And it chills sympathy for the Davidians as victims. WTROE makes its gravest charge against the FBI—that adult Davidians were machine-gunned as they ran from the burning Mt. Carmel Center on April 19, 1993—on a single piece of contested evidence. That evidence is the Forward-Looking Infra Red (FLIR) tape taken by government forces on April 19, 1993. WTROE does not question the veracity of this evidence, even though the source is the FBI, the very agency WTROE is accusing of murder. WTROE argues that the Davidian mothers and children were not deliberately murdered and that their deaths were the unintended result of the CS attack and fire. In forwarding this argument, WTROE accepts without question other highly suspect "evidence" from the FBI, apparently oblivious to the FBI's track record of destroying, manufacturing, and doctoring evidence. WTROE ignores a wealth of convincing evidence from a number of sources which confirms the charge that the Davidian mothers and children were deliberately murdered. WTROE fabricates a "they died of cyanide poisoning" story to explain the deaths of the children. WTROE makes blatantly false statements about the Davidian Autopsy Reports and "official" causes of death. WTROE dilutes outrage over Waco by showcasing the most repellent accusation against the Davidians. WTROE dilutes outrage over Waco by suggesting the atrocity was, in part, a product of the Davidians' belief system. WTROE reasserts the obviously false accounts of April 19 events, as told by some Davidian "survivors"— that the majority of Davidians were alive during the CS attack and fire and died as a result of those events. The message is: "They were alive on April 19, they really were …" (Except for those who got mowed down by FBI machine gun fire, see 1 and 2, above). WTROE protects the US military by casting Waco as a "law enforcement" event. This, despite overwhelming and obvious evidence that that it was a military operation from the beginning to the end. Psychological warfare is the most powerful weapon in the arsenal of military special operations efforts. This special form of warfare seeks to achieve social and political control of a populace by managing and manipulating human emotion and attitudes towards public issues. The aim is to create a compliant population and destroy political opposition without the expense and trouble of conventional warfare. When the USSR did it, we called it "propaganda." These tactics were used for decades by the CIA/US military in their "counterinsurgency" efforts in foreign countries, by the FBI within the United States during the COINTELPRO days of the 1960s, and are being used by the Pentagon and other agencies in this country right now. WTROE is a prime example. One thing is clear: The US military and its agents fear the people's reaction to Waco. They fear that a demand for the prosecution of the murderers of the Branch Davidians will grow and become a common rallying cry for all people who are deeply concerned with the way things are going in the US. Liberals have long deplored US military/intelligence atrocities overseas, and have been sympathetic to powerful US domestic government. On the other hand, conservatives have turned a blind eye to US military/intelligence atrocities overseas, and have deplored a powerful US domestic government. But Waco introduced a hybrid: domestic government agencies, using military tactics and equipment on American soil, killing American families in their home. Today, with Waco as a catalyst, liberals and conservatives are undergoing a melt-down in their thinking. That could spell danger for the Garrison State. What would happen if old-line liberals and old-line conservatives realized they had a common interest in halting the militarization of America? The emotions and attitudes of the US public must therefore be carefully managed to check this change in public thinking. Enter the counterinsurgency squad, the information warriors. Enter Waco: The Rules of Engagement. WTROE is advertised as a "film." It is not. It is a video, copied onto 16/35 mm film for theater showings. That's right, it is just a glorified video. WTROE is advertised as a documentary. It is not. A documentary is an examination of a subject using documentation and logic, presenting information in a logical progression. Premises are clearly stated, and rational conclusions follow. WTROE is a collage, a stew pot of imagery scattered across the screen. It takes themes from the Waco saga, introduces them, drops them, picks them up again, and scatters them over time. In WTROE, images and impressions are presented on the screen as pieces of glass in a kaleidoscope. What you see depends on your point of view. The collage format reveals the intent of the video. Using the collage technique, the producers slyly take hold of the viewer's emotional shirtsleeve. They skew emphases, tell outright lies, lead the viewer to conclusions based upon false premises, and leave the impression that they have covered the subject. For those who are already convinced that the government murdered the Davidians, WTROE presents footage that allegedly shows the Davidians being mowed down by FBI machine guns as they try to flee the building. Naturally, after the release of WTROE, experts come forward to disagree on what the footage shows. But for those who are convinced the government merely "made mistakes" and the Davidians were religious fanatics and child abusers, WTROE presents lots of supporting evidence to confirm their opinions. All the old allegations against the Davidians—from Koresh's alleged womanizing, child molestation, illegal guns, weird religious beliefs, you name it—are exhumed and showcased. WTROE is carefully engineered to change few opinions, despite hype to the contrary. The result is a thoroughly ambivalent message: Nothing is communicated that is not already in the mind of the viewer. Fired with rage and disgust, the two sides of the issue are even less capable of communicating. Playing one side against the other—the balance is perfect, and the murderers are safe. Those who publicly claim the Branch Davidians were murdered with malice aforethought are acting as prosecutors of the murderers in the court of public opinion. If the prosecution argues effectively and persistently over time and convinces the public with hard evidence, the prosecution will win. Public sentiment may then demand that the murderers of the Branch Davidians be prosecuted in courts legally empowered to punish. The Pentagon might even suffer severe reductions in budget. But if the prosecution's case is poorly argued in the court of public opinion, the case will fail, the push for legal prosecution will fizzle out, and the murderers will continue to walk free among us. The US military/government wants this to happen, of course. That's why so much hangs on how the case against the murderers is argued. That's why so much hangs on the quality of evidence brought to the jury—in this case, the public. WTROE rests its gravest charge against the FBI—the charge of deliberate murder—on aerial footage of the Mt. Carmel Center taken on the day of the fire. The footage was taken by a surveillance plane equipped with Forward-Looking Infrared (FLIR) equipment which records differences in heat on the ground. The resulting FLIR footage, of course, must be interpreted by an expert. Classically, whenever you rely on high-tech, esoteric evidence that must be interpreted by experts, other experts will disagree on what the evidence shows. The FLIR expert interviewed in WTROE says the footage shows a rapid fire weapon being fired at the back of the Mt. Carmel Center. The narrator says two men were firing machine guns at the Branch Davidians who were trying to escape from the burning building. Of course, other experts have come forward since the release of WTROE to dispute the claim that the footage shows gun fire. No so, they say. The Washington Post ran an article on April 18, 1997 "Still Burning," in which reporters tell us that they saw the FLIR tapes in the FBI's audiovisual lab, where film quality was far superior to the footage in WTROE. Of course. After viewing the FLIR footage, The Post reporters took a one-hour excerpts to 12 FLIR experts. What did these experts find? Why, the experts disagreed. Some saw gunfire. Some saw sunlight reflections. "How could so many analysts come to such different conclusions?" asks the Post, and then supplies the answer: "Reading FLIR, it turns out, is as much an art as it is a science … Everyone sees things differently." So much for the case that the government machine-gunned the Branch Davidians on April 19. The FLIR tape was (allegedly) taken by the FBI on the day of the fire. The FBI lab has already been caught faking evidence in other high profile cases. WTROE uses the FBI's footage without question. Question: Why would anyone accept the FLIR tape at face value, and not raise the question of possible doctoring? Answer: Because the purpose of WTROE is not to foster public outrage, but to blunt, confuse, and disburse it. WTROE is batting for the other team. Question: Since April 19, 1993, the FBI has been facing public accusations of murdering the Davidians. Why would the FBI release to the public a FLIR tape that could be used to bolster a murder case against them? Answer: The US military were the prime movers in Waco. The February 28, 1993 raid was a military event, no matter how labeled. The FBI is a front for the US military—the deputy director (read: director) of the FBI's Domestic Terrorism Section is Col. Jeff Ellis, an active duty member of the US Army. Yes, Col. Ellis is active duty Army, despite the provisions in the U.S. Constitution and the U.S. Code at 18 U.S.C. 1385 ("The Posse Comitatus Act") which prohibit the use of U.S. Military for law enforcement. There could hardly be a more brazen or flagrant violation than an active duty U.S. military person serving as the Deputy Director of the "Domestic Terrorism" section of the FBI. So it makes sense to let the "FBI" take the heat. The FBI releases a tape that can be ballyhooed as evidence of murder. Then the tape can be shot down as inconclusive. When that happens, the case against the "FBI" will be discredited. The US military will not be brought into the picture. Voila! To gain more understanding of this strategy, let's look at a hypothetical case. Aunt Tillie was murdered in her kitchen with a meat ax. Joe Bloe was seen entering Aunt Tillie's house with a meat ax. Neighbors heard Aunt Tillie screaming, "Stop, it Joe!" Joe was seen running from Aunt Tillie's with blood on his hands. Aunt Tillie's body bears wounds consistent with ax-blade chops. Joe's ax is found next to Aunt Tillie's body, and it bears his fingerprints. Joe is arrested for the murder of Aunt Tillie. But when the case comes to trial, the prosecutor ignores all this compelling evidence and instead claims Joe ran over Aunt Tillie with a two-ton truck at a construction site on the other side of town. The jury hears the case. During cross-examination it becomes obvious the prosecution has no compelling evidence. The jury finds Joe not guilty. Why? Because the prosecutor has no evidence to back up his charge of murder-with-a-two-ton-truck. So Joe Bloe, who really did murder Aunt Tillie, goes free. Similarly, in the courtroom of public opinion, the WTROE prosecution presents evidence that will be shot down by any moderately competent cross examination. Discrediting charges based on weak evidence that the Davidians were murdered will have an important propaganda benefit: charges based on solid evidence will be dismissed as already "disproved." That is, the discredited WTROE charges will be used to inoculate the public against real evidence that was ignored in this production. Discussion of this technique can be found in David Martin's Thirteen Techniques for Truth Suppression in the Library of the Waco Holocaust Electronic Museum. See Technique No. 4. "The actual cause of each Davidian's death remains officially unknown because the FBI interfered with the coroner's investigation" (Script, pg. 39). Not so. The official cause of each Davidian's death is given in the Autopsy Report, the FBI official report, and Death Certificate. You can examine many of the Autopsy Reports and official causes of death yourself. On July 2, 1997, this writer called the office of the Justice of the Peace, Precinct 2, McLennan County, Texas (where Mt. Carmel was situated). According to the Judge's assistant, Belinda, no changes have been made since the autopsies were done and the death certificates signed in 1993. On the same date, a similar call to the Records Custodian at the Office of the Chief Medical Examiner in Tarrant County, Texas, confirmed what Judge Collier's office had reported. Certainly Dr. Nizam Peerwani, Chief Medical Examiner of Tarrant County, a man known for incompetence, was chosen to conduct the Davidian autopsies. Certainly the manner in which those autopsies were conducted violated many professional and scientific standards. Certainly many of the "official" causes of death are not correct. But despite what WTROE says, each of the 80-odd autopsies contains an officially assigned cause of death. They were assigned in 1993, and remain "official" today. "Besides gun shot wounds, the majority of bodies had high levels of hydrogen cyanide—the deadly poison produced when CS burns. The backward bowed corpse of this eight year old girl shows what cyanide does to the human body. It makes muscles contract so violently that they can actually break bones." (Script, pg. 39). Wait a minute. Run that by us again. "… the majority of bodies had high levels of hydrogen cyanide—the deadly poison produced when CS burns." But bodies commonly contain hydrogen cyanide residue after a fire. Forensic pathologist Dr. Michael Baden is a former chief medical examiner in New York City. In his book Unnatural Death—Confessions of a Medical Examiner (Random House, 1989), he cites a not atypical case when cyanide was introduced into lungs and blood of airplane crash victims from burning plastics in the plane (pg. 39). So cyanide can easily be released in a fire in ordinary circumstances, without the presence of CS. Let's look further. The bodies of the Davidian mothers and children were found in a windowless concrete room. The only ventilation came through a door opening (the door had been removed years before). Arguably, the atmosphere in this room would have been relatively uniform. Yet research director McNulty fails to tell us that while some of the children's bodies contained cyanide, some had no traces of cyanide at all. This phenomenon is neither mentioned nor explained. "The backward bowed corpse of this eight year old girl shows what cyanide does to the human body. It makes muscles contract so violently that they can actually break bones." (Script, pg. 39). Taken as a whole, this statement, along with the previous statements, gives us the impression that CS produced hydrogen cyanide in the concrete room, and, due to this, the specific child shown in the photograph died of cyanide poisoning. Yet according to the autopsy reports, neither this child nor any other Davidian died of cyanide poisoning. On what expert opinion is WTROE relying? According to the narration, WTROE is relying on the words of a scientist from the Environmental Protection Agency discussing muscular contractions in cyanide gas executions. We are not told whether this scientist is an experienced pathologist who has performed autopsies on victims of poisoning. "It's quiet, it's not messy, it's not noisy … there's even a spray mist around … you spray it in somebody's face and they go to sleep …" said the murderer. Baden tells how the murderer (a professional hit man) described a test murder he had committed on the street. The murderer simply walked along in a crowd with a handkerchief over his nose and sprayed the victim in the face. Did the man go into violent convulsions? No. "The man collapsed and died, and everyone thought he'd had a heart attack," says Baden (pg. 128.) Hardly the effect described by WTROE. "Acute poisoning from hydrogen cyanide or the cyanides is manifested by dizziness, nausea, staggering, and loss of consciousness." WTROE should have at least checked the local library. Either of these commonly available sources should have raised a flag. Yes, research is needed on the significance of cyanide traces in some Davidian bodies. But not the kind of research WTROE has done. So, then, agents other than cyanide could have been responsible for the backward bowing of the child's body in the photograph. Even in this one case, is there any other evidence that led WTROE to come up with its "death by cyanide" conclusion? If so, it's a shame they did not share it with the audience. While WTROE makes false and questionable statements about the Autopsy Reports and causes of death, it ignores real and obvious cover-ups in the official death stories. An examination of these problems certainly should have been a part of any "documentary" touching on the subject. To begin with, there is the character of the chief medical examiner, Dr. Nizam Peerwani. As mentioned above, Peerwani had been known as an incompetent before he was chosen to handle the Davidian remains. In fact, reputable and qualified medical examiners had volunteered their facilities and services in handling the Mt. Carmel deaths, but all were refused in favor of Peerwani's establishment. "The actual cause of each Davidian's death remains officially unknown because the FBI interfered with the coroner's investigation." (Script, pg. 39). As evidence, clips are shown of Peerwani and another staff member complaining about their treatment. But during the 1994 San Antonio trial of the Branch Davidians for the murder of the ATF agents, Dr. Peerwani testified that the FBI helped him with the autopsies. Peerwani stated that (1) he himself asked the FBI to send down two Smithsonian Institution forensic anthropologists to help him in the recovery of the bodies, and the FBI obliged (Transcript, pg. 6019); and (2) the FBI helped him by supplying him with fingerprint experts (Transcript, pg. 5962). Much of Dr. Peerwani's testimony may be found at this website. Dr. Peerwani's signature, or the signature of one of his staff members, appears on each one of the Branch Davidian autopsy reports. None of the autopsy reports contain any complaint that the doctors suffered interference in their work from anyone. WTROE did not confront Dr. Peerwani on this subject. Dr. Peerwani and his staff allowed many of the bodies to rot in the elements—the official recovery maps show that the last body was recovered on April 29, 1993, ten days after the fire. Allowing the bodies to rot in the field was no less than destruction of evidence. Dr. Peerwani and his staff members omitted estimates of time of death from each autopsy report. This omission is stunning, considering much of the work of forensic scientists is directed to answering this very question: the time of death. Dr. Peerwani swore under oath in courtroom testimony that many of the mothers and children died of suffocation and blunt force trauma when the concrete room (in which they were allegedly seeking shelter) collapsed. Dr. Peerwani testified he visited the site shortly after the fire. But pictures taken from the ground and from the air show that the concrete room did not collapse. WTROE did not confront Dr. Peerwani on this almost certainly perjurious claim. By far the most politically explosive aspect of the Waco Holocaust is the way in which the mothers and children met their deaths. Consider that many of the adult Davidians were accused of shooting at the FBI agents on April 19, but the mothers and children were not accused of any crimes. They were utterly innocent before the world. In the theater of the Waco information warriors, putting attention on weak evidence of the murder of those already accused of a crime sure beats putting attention on the plentiful and compelling evidence of the murder of the demonstrably innocent. Through a series of administrative bungles and good-old-fashioned government incompetence, the government created a firetrap in the home. The CS heated up, produced cyanide gas, and killed the children. Ooops! There we have it. The government did not intend to kill the children and mothers. Their deaths were merely the by-product of negligence during the attempt to force them out of the Mt. Carmel Center. Simply shouting "murder" at the end won't do. WTROE blames the children's deaths on negligence, and any judge and jury will understand. How Likely Are These Stories? Early in the presentation, pieces of the collage that is WTROE shows us the Branch Davidians as a group of people who were intelligent, practical, courageous, loyal to each other, and protective of their children. But then WTROE asks us to believe that on April 19 they became stupid yellow-bellied cowards. "As the gassing continued, the women and children went to the safest place left inside Mt. Carmel—the kitchen storage room, a first floor steel reinforced concrete room—a former vault—at the bottom of the square wooden tower" (Script, pg. 35). Comment: The concrete room had no windows and one doorway with no door. It formed a cul-de-sac, had no ventilation, and would have been a catch basin for the CS-poisoned air. The concrete room would be the worst possible place to shelter from the CS. Why would intelligent, practical people send mothers and children to this place? Why would any mother with a grain of common sense go there? This story is not believable. Comment: While the mothers had gas masks, the children did not. Imagine—you are a mother who has a gas mask, but your children and babies do not. So you take them to a catch basin where the poisoned air can't blow off (the concrete room) and watch them from behind your gas mask as they choke and splutter and bubble up their lungs. "And I can just see those kids barfing, vomiting, screaming because you can't possibly have a gas mask that will fit a little kid." (Script, pg. 32). Comment: Yet the moms stayed and watched? This story is not believable. Comment: Let's examine this. A tank had smashed its way to the concrete room to spray the CS. The path made by the tank, entering and retreating, would have crushed any debris that might have blocked an exit, and would have created an ideal path for mothers and children to flee from the choking CS. Realize that the fire had not broken out by then, and the cyanide "from the CS" was not yet released and the mothers and children had not yet "died of cyanide poisoning." Yet they did not try to escape. The mothers opted to stay inside the concrete room with their children and babies "barfing, vomiting, screaming" until the fire broke out and they died of cyanide poisoning—while a path of exit is within view. Believable? No, this story is not easy to believe. Assertion: Meanwhile, when the fire broke out, the other Davidians (not the mothers and children) who were situated close to the concrete room callously abandoned the mothers (with gas masks) and their children (in death throes) and headed out the back of the building in an attempt to save their yellow hides, whereupon they were promptly mowed down by machine guns. Comment: But … why did the would-be escapees not take the mothers and children with them? Were they not a tight-knit, courageous community? Comment: David Thibodeau has claimed he was married to Michelle Jones, and loved her three children, Serenity Sea, Chica, and Little One. If so, how believable is it that he waited for a fire to break out before he checked on them that morning? After all, he knew the children did not have gas masks. If the concrete room was the best place to be during the CS attack, why was he not there with them? If the concrete room was not the best place to be during the CS attack, why did David not have Michelle and the three children with him? After all, he escaped! David Thibodeau's story is not believable. Comment: Hold that frame. There is no record (and no suggestion in the video) that any of the surviving Branch Davidians received treatment for CS poisoning. How can this be explained? "We would move the opposite way to get away, as far away from direct contact with it as possible, if you got it on your skin, an exposed skin would just burn the heck out of you. Felt kind of like battery acid of something like that. Very irritating, very painful." (Script, pg. 35). But still, despite the length and intensity of the CS attack, Clive needed no treatment. Another Branch Davidian survivor reported that the concentration of CS varied, depending on where you were in the building. If this is true, one is again left asking why the mothers and children were led to the concrete room, the cul-de-sac with no ventilation. Why didn't they move from room to room too, depending on the atmosphere, as this survivor did? There are alternative explanations on why the survivors were not treated for CS poisoning, including: (a) despite what we have been told, CS is not poisonous and the survivors needed no treatment; (b) CS was not used on April 19; (c) the CS-poisoned Branch Davidians needed treatment, but were denied it, an act of cruelty they have not yet reported; (d) the "survivors" were not at the Mt. Carmel Center during the CS attack as they claim, and have been coerced by some means to help the government with its "negligence" cover story. The makers of WTROE were aware of evidence concerning the deaths of the mothers and children as the video was being researched and produced. I know this because in the fall of 1996, director of research McNulty called me to ask for assistance. During several conversations, McNulty admitted he had visited the Museum and was aware of its contents. Some corpses found in the concrete room were so decomposed that the connective tissue had withered, indicating a date of death well prior to April 19, 1993. In addition, the decomposition states of the bodies generally varied widely—some were severely decomposed, some only moderately decomposed, indicating the victims died at different times. Many of those Dr. Peerwani said died of suffocation and blunt force trauma in the (non-existent) structural collapse of the concrete room were found without heads. The autopsies do not question this phenomenon, even though it is evident that structural debris would hold a crushed head securely under its weight. Eleven Davidian bodies found in the concrete room were compacted together in an agglutinated mass. Dr. Peerwani's autopsies do not address this phenomenon. There is other compelling evidence that the mother and children died under other circumstances and from other causes than those given on the autopsy reports. The evidence indicates the bodies were laundered to disguise the causes and circumstances of death. The evidence indicates the bodies of the mothers and children were moved into the concrete room after death. This evidence is fully available for download in the Museum's download page. Because the evidence is found in publicly available documents, WTROE need not have given any credit to the Museum for its research. WTROE could have questioned Dr. Peerwani on these anomalies, and perhaps called in other experts to comment. Instead, WTROE let Dr. Peerwani off the hook. It chose to ignore these matters. While ignoring these substantive issues, WTROE made false and unsupported statements concerning cyanide poisoning (see above). Surely the makers of WTROE are covering up for the murderers. Back: Waco "Documentary" is a Hoax!